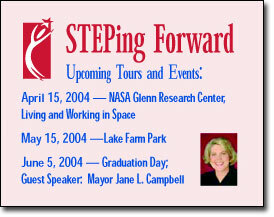 On September 20th, 2003 orientation for the 2003-2004 Student Technical Enrichment Program (STEP) was held at the Cleveland Division of Water. Parents and students were treated to a continental breakfast prior the program. During orientation, the attendees were told about the program's guidelines and purpose. An overview of the upcoming tours as well as the academic curriculum required for this year's program was also discussed. The staff of STEP would like to thank the parents and students who attended orientation, and would also like to thank the Cleveland Division of Water for hosting this event. We look forward to working with your students. On October 18, 2003, the STEP students attended a tour of the Cleveland Metroparks Zoo Rainforest. Upon their arrival, students participated in a scavenger hunt. They had to find specific facts about several different species of animals and plants. Some of the students participated in an interactive experiment involving eels. Students had to complete worksheets on the information they gathered on each different group of species found in the Rainforest, e.g., reptiles, amphibians, fish, plant life, and mammals. After having lunch, students then discussed several issues regarding the Rainforest in a group letting, then wrote in their journals. Afterward, students conducted an experiment where they were able to see the effects of CO2. The students were divided into groups, and each group given an empty pop (soda) bottle. They were then instructed to fill the bottle half way with water. At that joint they added 4-5 pieces of Alka-Seltzer� and quickly placed a balloon over the top of the bottle and watched the balloon inflate from the CO2 produced by the Alka-Seltzer�. Thank you to our contributing partners who make STEP a success! 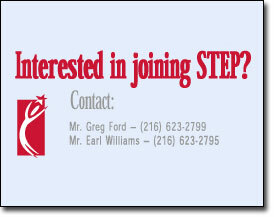 On Saturday November 15, 2003, the STEP group convened at the Cleveland Division of Water. During the morning, students practiced and rehearsed the Public Service Announcements and News Anchor Stories that they prepared for this session's homework assignment, in preparation for their tour of the John Carroll University School of Radio and Television. Upon arrival at the University, the students were divided into two groups and given a tour of the School of Radio and the School of Television, respectively. 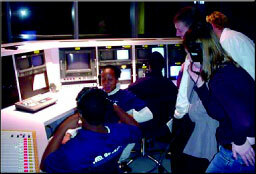 After the tour, the group assigned to the School of Television started recording their anchor spots. While some of the students were recording, the other students were given the opportunity to take on different responsibilities of producing a news broadcast. Some assumed the role of "floor manager," while others worked the cameras, introductory music, and graphics, which includes the name of the broadcaster and the topic of the story in which they are talking about, shown at the bottom of the TV screen. Simultaneously, students who were at the Radio school, had similar experiences. They were able to view a "live radio broadcast" in addition to learning how the controls worked. Students were also given the chance to record a Public Service Announcement. After returning to the Division of Water for lunch and classroom curriculum, the students wrote about their experiences of the day in their journals and worked on some math problems similar to the ones they will see on their proficiency exams during the school year. 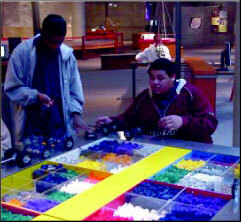 On Saturday, January 17, 2004, the students participating in STEP embarked on a tour of Inventure Place in Akron, Ohio. The tour started with a tour of "The National Inventors Hall of Fame." Here the students were divided into two groups and were given facts and trivia about inductees and their inventions. Each inductee had a picture and a short description of why he or she was in the Inventors Hall of Fame. Many of the students said this part of the tour was educational because they had the opportunity to learn about inductees and inventions that are not in their text books at their respective schools. Several students were also impressed by the openness of different inventions, like the elevator, because they could see how everything worked. The students then moved to the bottom floor for the hands-on activities. It is here that Inventure Place offers something for everyone. Some of the students made crafts in the Arts and Crafts area, while others preferred the "Woodshop Room." This room was a hit with both boys and girls because they tinkered with tools such a saws, hammers and drills. The students made key hooks, plaques with their initials, and birdcages. Many of the students took their creations home. An added bonus came in the form of a "psychology exhibit." Saturday was the first day of the exhibit that will run through August. The exhibit featured different examples of how we think and come to many of the conclusions that we do in our normal every day lives. One of the more interesting exhibits was that of "interference." 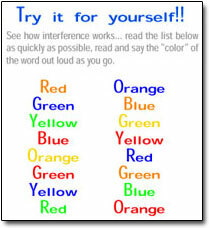 Interference is anything that interrupts a natural neural process, regardless if it's for information coming in or going out of the brain. Overall the students seemed to have had a GREAT experience at Inventure Place. 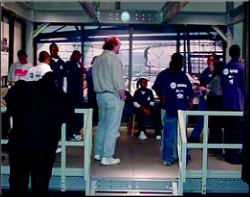 Saturday, December 13, 2003, the participants of STEP visited the "new" Cleveland Health Museum, Health Space. 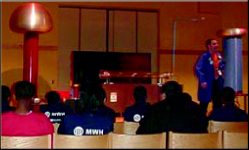 Students were greeted and taken to the auditorium where they participated in two activities. The first activity was "Disease Detectives - Outbreak Investigation." In this activity, the students had to use clues provided by the instructor to determine what disease was causing a particular "outbreak or epidemic." By using the process of elimination based on the information given, or based on missing information, the students were able to solve the problem and discover what disease actually caused the outbreak, and as a result, were able to determine the appropriate treatment method to use. The second activity was "Genetic Coding." During this activity, the students learned about the methods used to determine and trace one's genetic code. Students were given exact instructions to be able to find out if the genetic coding matched an individual's "DNA" or not. The remaining time at Health Space was used to give the students the opportunity to walk around and tour the new facility, and to see everything that it has to offer. After the tour, the students returned to the Cleveland Division of Water where they had a "festive" holiday lunch. The students then convened in the auditorium and spent time discussing the issues and activities of the day's tour, in addition to writing about the day's events in their journals. At the conclusion of the day, all participants received a gift, courtesy of the Cleveland Division of Water. On Saturday February 21, the participants went to the Great Lake's Science Center. During their visit, the focus of the day was on engineering, in celebration of National Engineers week. Students were able to see two of the new exhibits on hand at the Science center. The first exhibit was "Raising the Roof." Here students were exposed to the many different types of structures and engineering designs that have been used over the years. One such structure was that of the "dome," where tension created by ropes was used to raise and lower the structure by use of a hand crank. On hand, students had the expertise of structural engineer Tom Delaney, and architect Shana Wygonik of MWH to give students insight on more of the intricacies of how buildings are designed. They learned that engineers and architects have to know what exactly the building's or structure's end use will be when they design buildings. In conjunction with the "Raise the Roof" exhibit another group of students saw an exhibit on electricity. This group saw several demonstrations of how electricity works. They saw a magnetic field created, the effects of static electricity, as well as having a chance to participate in the various demonstrations. Students then had the opportunity to attend the engineering career fair that was taking place. In addition, many students took the opportunity to view the many other exhibits at the Great Lakes Science Center as well. Afterwards, students ate lunch at the Science Center and discussed the exhibits that they saw during the first half of the day. The group then viewed the Lewis & Clark expedition documentary in the IMAX Theatre. Students were able to learn about the amazing 28-month adventure of the two great explorers, Lewis & Clark as they mapped out and explored the newly purchased territory by the United States (The Louisiana Purchase). Finally, the tour concluded at the Cleveland Division of Water with the "egg drop" competition. Participants of the STEP group were asked to design a container in which an egg could be placed into and then drop and have the egg survive the fall. Students then tried out the design where they dropped the containers from heights starting at 15 feet up to heights of 50 feet. At the end of the day we had two winners whose designs of their egg containers were successful from 50 feet.